Ever wondered how white flour is made? Commercial wheat production is a study in pesticide application. Not only are the starting seeds treated with fungicide, the growing wheat is sprayed with hormones such as cycocel to influence production. More pesticides are added in the field, as the growing season progresses. After the harvesting of the wheat is done, the wheat grain or "berries" are stored in bins which have been coated with insecticides. If any bugs are still hanging around at that point, the farmer will fumigate the grain. It is from this pesticide soaked grain that commercial flour is made. Once the milling process starts, more damage is inflicted. Wheat grain kernels are composed of three layers: the bran, the germ, and the endosperm layer. The bran is the outside layer where most of the fiber exists. Most of the nutrients and fats are in germ layer. The endosperm is the starchy middle layer. The natural nutrition associated with whole grains exists only when these three layers are eaten together. Old time stone mills ground the flour slowly, and the resulting flour had all three layers mixed in. (This result is called "100 percent stone-ground whole-wheat flour"). But in mass production flour mills, stone grinding isn’t efficient enough, so high speed, high temperature steel roller mills are used. These high speed mills remove the bran and germ, and the resulting flour is made up of mostly the starchy endosperm layer. Much of the bran and germ "waste product", which is the most nutritious part of the grain, is sold as animal feed. The resulting white flour contains just a fraction of the nutrients of the original grain, with the heat of the steel rollers also playing a role in the nutrient destruction. It is at this point that the chemicals are added. After applying pesticides and ditching most of the nutrients, the flour manufacturers then subject the starchy flour to a chlorine gas bath. Note that the Environmental Protection Agency (EPA) identifies chlorine gas as a flour-bleaching, aging and oxidizing agent that is a powerful irritant, dangerous to inhale, and lethal. The flour manufacturers use a form of chlorine gas to bleach and artificially "age" flour. The goal, of course, is a clean, white product. The chlorine gas reacts with the flour, oxidizing, whitening it and reducing the gluten. But it also converts an dough additive called xanthine into a toxic substance called alloxan. The alloxan is an unintended byproduct. Alloxan is a toxin which destroys pancreatic islet cells, resulting in diabetes. In fact, Alloxin is specifically used in research labs to induce diabetes in rats and mice for study purposes. After the chlorine bath, we get nice, white flour completely devoid of any natural vitamins. And since all the natural vitamins have been destroyed, the bleached flour is mixed with synthetic vitamin and mineral supplements to "enrich" it. These synthetic vitamins are made from petroleum, elemental ores, bacteria, fungi, and ferrous iron, which is created from sulfate refined out of high sulfur crude oil. In 1906, the North Dakota Agricultural Experiment sent out 24 surveys to flour mill executives and asked them about their thoughts on the flour bleaching process. 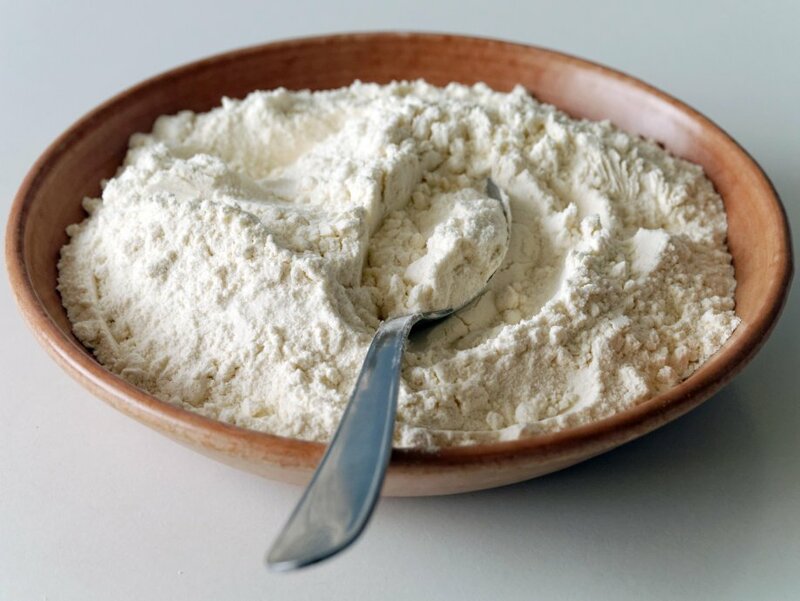 Eighteen of those millers wrote back and said that flour bleaching was unnecessary and harmful to those eating the flour and was deceitful to the public buying the flour. In 1910, bleach white flour was declared unfit as human food by the Federal Western District Court of Missouri. Legal wrangling ensued and the case wasn’t settled until 1919. But according to H.W. Wiley, first chief of the Food and Drug Administration, the enforcement of this law was "halted through the political influence of the flour millers" and "no notice of violations has since been made by the FDA." Mr. Wiley’s book "The History of a Crime Against the Pure Food Law" discusses this case. White flour is the ultimate refined food. It provides little nutrition and for some people, wheat and similar grains can actually be harmful to eat. These grains contain gluten, a indigestible protein which is associated with the symptoms and gut damage of Celiac Disease. People with a gluten intolerances have to follow a gluten free diet. For more Information, Jen Albritton has written much more extensively about the process of growing wheat and milling flour at the Weston A. Price site and Sayer Ji has an excellent article here on the dangers of wheat consumption.